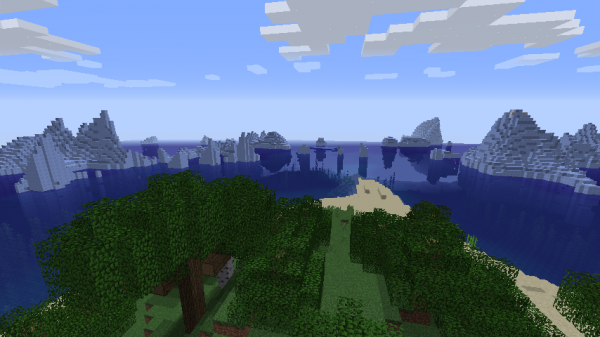 The best Minecraft seeds – what are they? In fact, what even are Minecraft seeds? 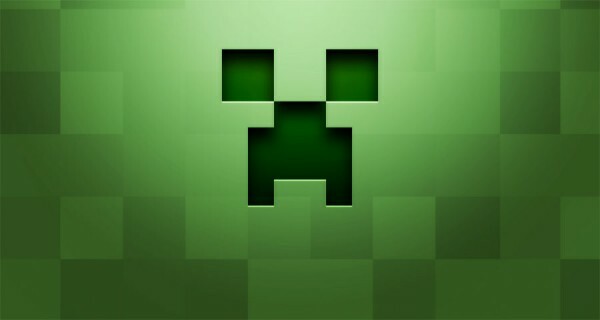 In the simplest terms, seeds are a collection of digits that decide what goes where in Minecraft. Whether you want a sprawling jungle or an inhospitable ice biome, we’ve got you covered. 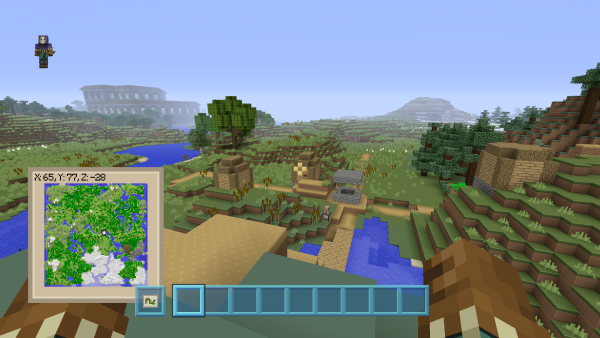 Whatever your fancy, these Minecraft seeds have something for everyone. However, do keep in mind every time a new update rolls out there’s a chance the new data could alter how the seed generates the world. Maybe something doesn’t show up or it’s moved really far to the left, that sort of thing. Every seed here works as of writing, but if you’re reading this in the future, which is your present, things may appear a little differently. But don’t forget, if you’re a Java Edition user, you can always roll back to a previous update in the launcher options. With that in mind, let’s start there first. Remember when everyone was excited about fossils? 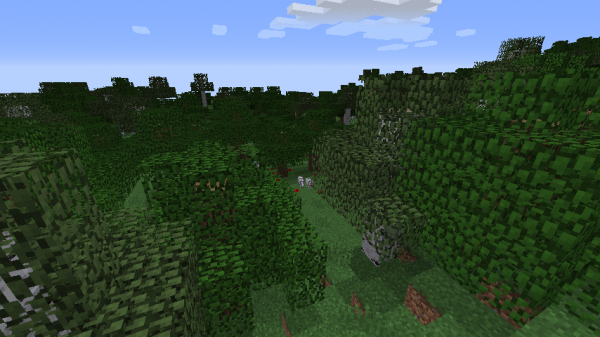 Me neither, but if you’re feeling the urge to become a palaeontologist, this seed spawns you right near a ravine. Carefully scale down said ravine and when you reach the darkened area you’ll spot yourself a pearly-white fossil. Just make sure you bring torches with you if you want to see what you’re doing. File this one under ‘Island Retreat’. What makes this such a good pick is the size of the island – not too big that it ends up being just another clump of land, and not too small that all you can put on it is a piddly little dirt hut. Plus, having that many trees available is also pretty handy. How you finding Update Aquatic? Good, yeah? Cool. We’ve covered a few different aquatic seeds so far, but for the ultimate challenge, this seed puts all your skills to the test. Can you survive the (really, really) deep ravine and live to tell the tale? Will you succumb to the seemingly infinite darkness that consumes the depths? Probably, to be fair, but it’s still worth trying. Now I’m the king of the swingers, oh, the jungle VIP. I’ve reached the top and had to stop because my food bar depleted and I starved. Sometimes starting against the odds, in this case lost in an ample forest, brings its own kind of excitement. Crank up the difficulty, too, and you’ve got a recipe for a real challenge. Ohhhhh, oobee doo, I wanna murder you-hoo-hoo. Another island for you, but this time with a twist. It’s a nicely-sized island, sure, but surrounding it is a deathbed of icebergs. Not only is it rather striking, the possibilities for what you could build are endless. I’m pretty sure with enough ice blocks you could easily turn these ‘bergs into a surrounding wall. Try sailing a boat through that without it turning to splinters. 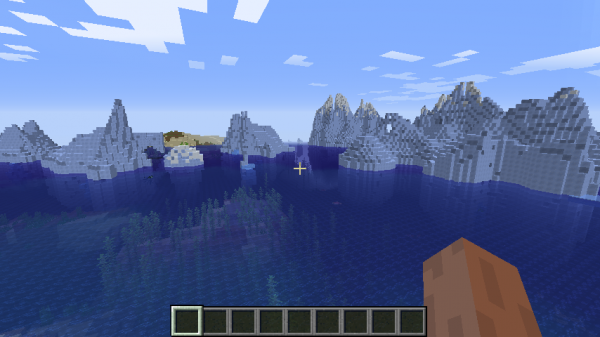 With this seed you’ll spawn on an island surrounded by icebergs. But don’t get too comfy up in here, because if you turn 180 degrees and dive into the water you’ll be treated to a shipwreck and the chance of loot. This seed is pretty much the sequel to Titanic you never knew you wanted. For those looking to get into a scrap the second they spawn, this seed dumps you in a world near a mansion. Trek through the jungle and you’ll find this wooden deathbed waiting for you on the other side. Just keep an eye out for the illagers (not a typo) running the place. And maybe arm yourself before you go in? Want excitement mixed with a smattering of death from the off? Look no further. Turn from the spawn and you’ll find yourself a deep ravine. 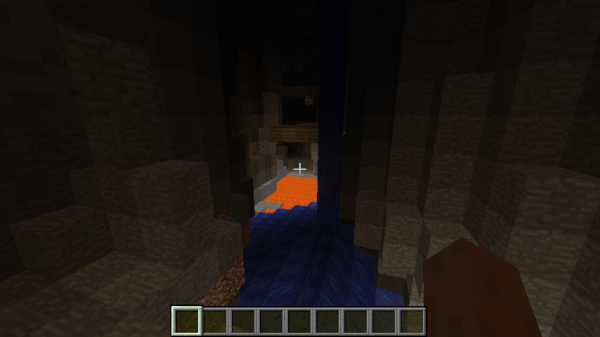 Not only that, but there’s also a broken mineshaft that hasn’t spawned in correctly. How you’ll get down to it is anyone’s guess, but hey, I just come up with the seeds, it’s your job to not die. I’ve never understood why zombies burn in the sun. Isn’t that vampires? Anyway, make sure to set the in-game time to night (“/Time Set 12000”) when you load in, otherwise this zombie village will be a ghost town thanks to Minecraft’s ‘mobs burn in sunlight’ rule. Also be sure to press ‘F’ to pay your respects to the villagers who lost their lives bringing you this seed, you absolute monster. By setting the world size to classic, you can really break the game in brilliant ways, which we just had to do, obviously. 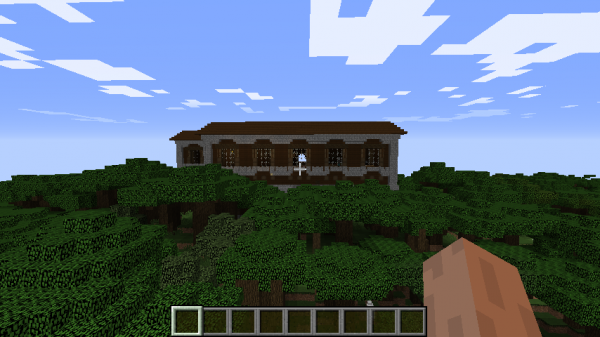 This seed contains three mansions (with loot), three temples (also with loot), and a ridiculous four villages – all within walking distance of one another. If you fancy keeping a world for farming Trophies or Achievements, this is the one. If the classic world size isn’t to your liking, read on. 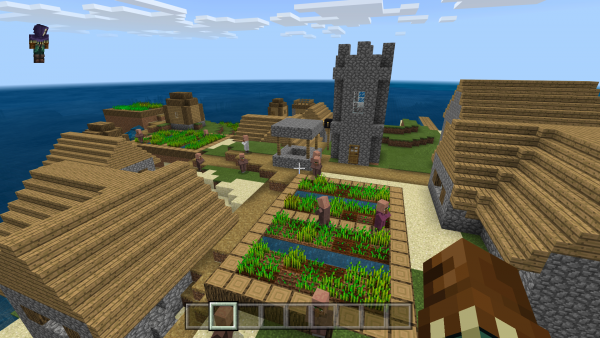 While this seed doesn’t contain a game-breaking amount of loot, four villages and two sand temples – all within walking distance – aren’t anything to turn your nose up at. Plus, once you’ve looted up you’ve still got the rest of the world to explore or build in. This is a solid survival spawn without feeling like you’ve cheated. Well, too much anyway. Skeletons, right? How many times have they killed you? You’re just strolling through a cave, minding your own business, then a skeleton pops you in the head (and then your loot all falls into lava, because of course it does!). Ah. If you’d like to turn the tables somewhat, at the Northern area of the map is a square hole filled with sand. 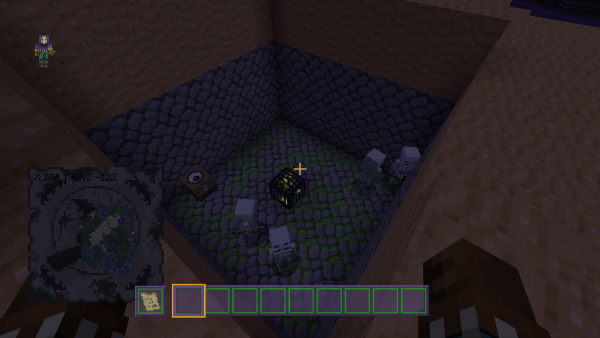 Dig up the sand to reveal a spawner, then watch as the skeletons start spawning and instantly burn in the sunlight. Revenge is sweet, eh? Have you ever found yourself walking for what feels like hours hoping, praying, you’ll stumble across a village? Your problem is now solved. You’ll spawn near a village, but wait, what’s that in the distance? Why, it’s another village. There’s also an igloo nearby along with a few different biomes to explore. You’ll never go hungry again. For the people who thought four villages were a lot, here’s a seed with six. Again, there’s a tonne of loot to be pillaged to get you up and running, and not only that, if you head to the rough centre of the map and dig straight down you’ll happen across a Stronghold. Is this another seed to add to your Trophy and Achievement-hunting list? Quite possibly. Sometimes it’s okay to cheat. If it wasn’t, then what’s the point in having seeds? 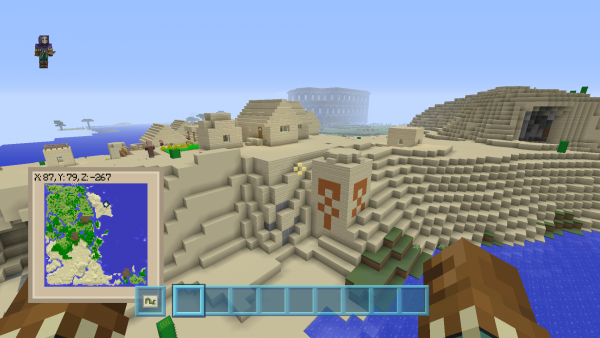 With this one you’ll find a rather obscene three jungle mansions as well as three different villages and a sand temple. Just be sure to set the world size to small else the game will spread everything out too far, and that’s no fun. 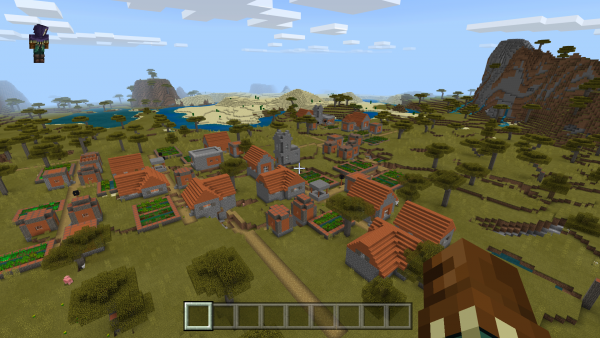 If you’re looking for a leg up when you start, this Minecraft seed puts you right near a village and a water temple so you can loot until your heart is content. Let’s dive right into this one. Ocean Monuments are a dime a dozen these days, but what about two in the same vicinity? 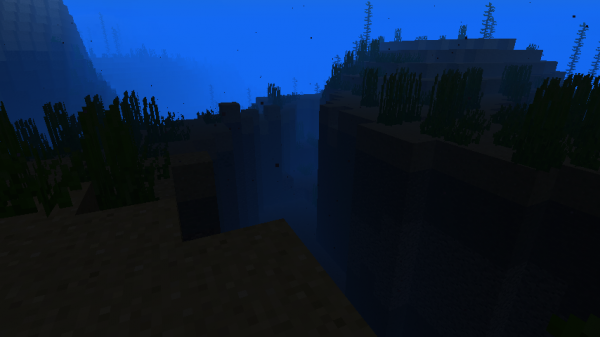 You’ll still need the usual underwater gear and potions, of course, but as a source of prismarine and sea lanterns, this seed has everything you could possibly desire for a decent underwater build. Spawning in a frozen biome is always a pain. The food’s normally dusted with frost so you can’t mine it and your only chance for survival is poking animals to death so they drop their precious meatsacks. But with this seed, that all changes. Not only is there a village with a mineable food supply, there’s also an igloo within walking distance which houses a zombie villager – a super useful way to complete the Zombie Doctor achievement. 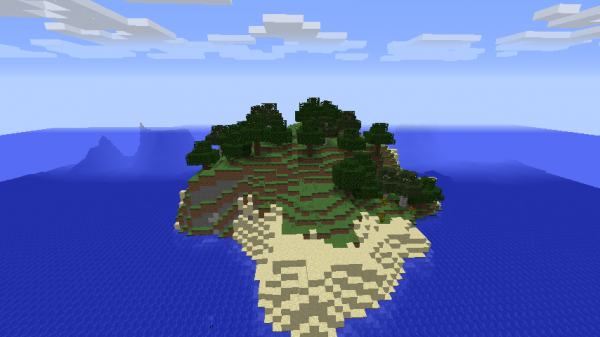 When you tire of putting up with other people and want to live the quiet life, this seed spawns you on an island away from it all. Sail on the vast water – should you get lonely and decide to reintegrate into society, there’s a nearby mansion full of people ready to shout at you for the slightest thing. It’s kind of like Twitter in that respect. We’ve all been there. You want to search for something but the idea of having to walk is too much effort. In the UK we call that ‘Summertime’. So if you’re looking for a stronghold without having to do the grunt work, this seed’s for you. Load it up and you’ll spawn in a ravine. Look down slightly and you’ll see some mossy stone. Inside is your stronghold. This seed is what happens when two worlds collide to create something strangely cool. 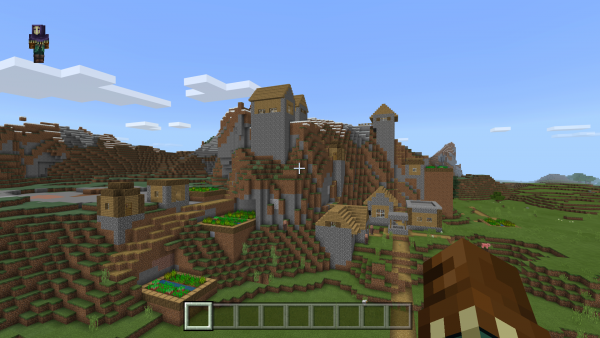 It’s a village, but it appears to have spawned in the wrong place, resulting in a unique mountain village. What’s even more surprising is how natural this all looks. Houses are still accessible and there’s a rather fetching set of crops which blend in effortlessly to the surrounding hill. Here’s the thing: if you have a seaside village, chances are you’re going to get a lot of flooding. That’s what happened here. If you dig down through the well you’ll find an underground dungeon. The catch, though, is this dungeon is completely flooded. While that sounds bad, with the right enchantments and potions this could be a great deep-sea loot hunt. We’ve already got a zombie village for the Java Edition but not for everything else. 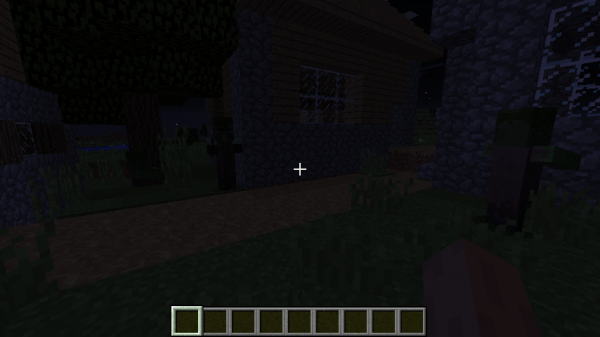 With this seed you’ll be able to experience the horror of a zombie village, only this time in the Bedrock editions. The same rules apply as the last: set the time of day to night otherwise these brain-guzzling villagers will burn up before you reach them. There’s an image online of a map with a hundred villages sprinkled together. This image is not entirely accurate (cough – clickbait – cough) and is clearly mods at work. That said, it is possible to have a smaller number of villages spawn right next to each other, which in turn forms a city. The chances are slim, but we managed to find a legit, working seed with its own mini-city. Behold! 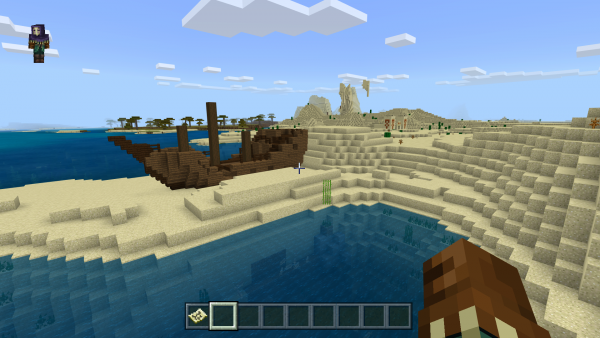 With the update aquatic out for Bedrock, what better way to test it all than by visiting a shipwreck in the desert (this also doubles up as the perfect example of irony). Why is there a ship in the desert? No idea, but shipwrecks have loot, so it’s definitely worth exploring. And you won’t even need any underwater potions to search it which is always a plus. Due to the procedural generation of Minecraft, sometimes things break. This seed is, thankfully, when things break in the right way. A short jog from the spawn point is a mineshaft that appears to have broken free from its underground shackles in a bid for freedom, leaving exposed loot and a wealth of unknown prizes to be discovered. If you’re after a strong start, you’re in luck. 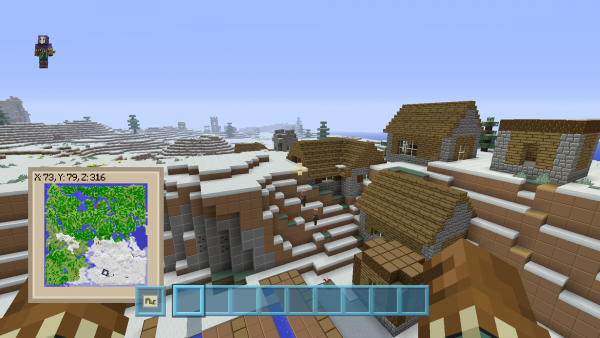 Not only is there a village spawn nearby, there’s also a blacksmith, complete with three diamonds. 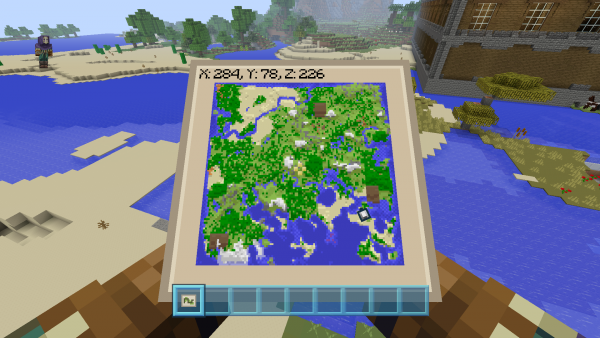 It’s not a game-breaking amount admittedly, but this seed is more about starting a survival world without needing to cheat or become god-like. Three diamonds is the perfect amount to start you off on any new adventure. 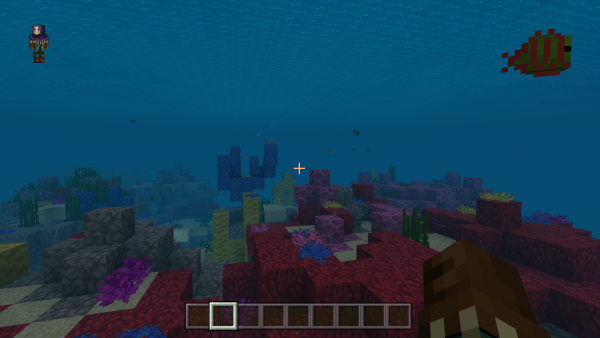 More underwater update aquatic antics for you. 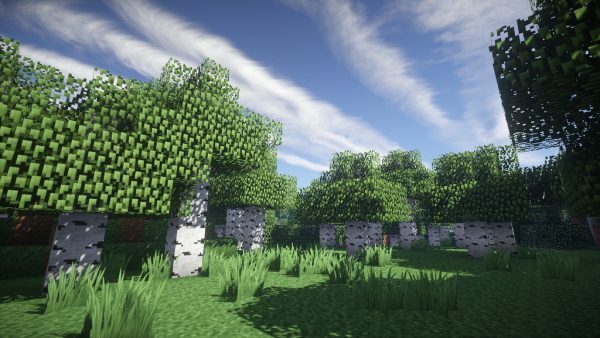 This time we’ll be taking a moment to appreciate just how beautiful Minecraft can be when it all comes together. Who’d have thought those murky depths would someday be turned into something so eye-grabbing? 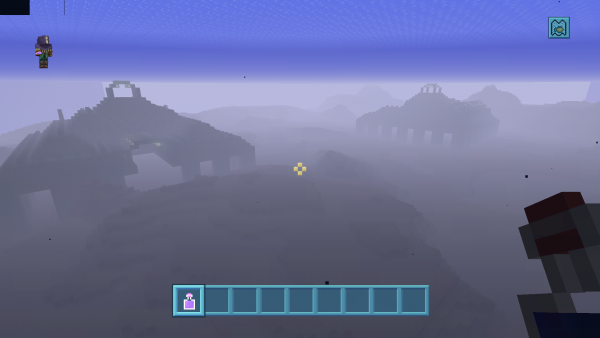 Oh, and there’s a shipwreck and underwater ruins nearby for all the deep-sea loot hunters out there. 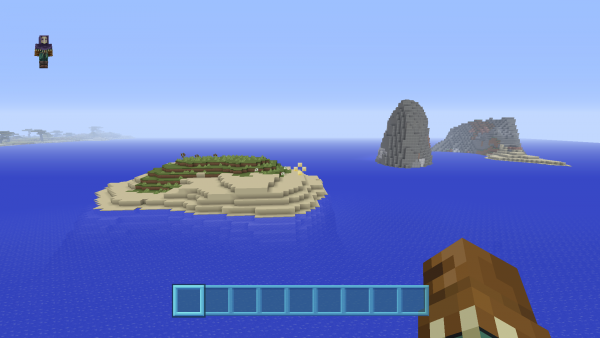 This Minecraft seed, suggested by commenter SandyShores, borders onto three different biomes: a desert, a grassy plane, and a savanna. Head straight the the desert section of the nearby village and break through the bottom of the well and you will find yourself in a stronghold straight away. 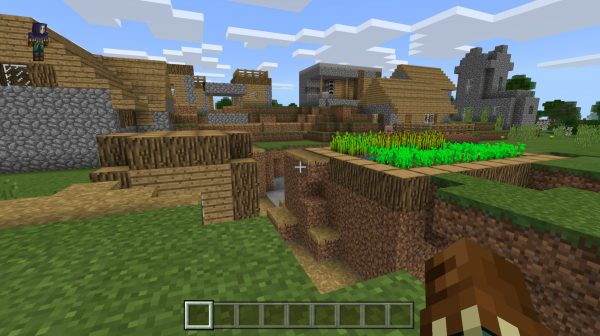 The post The best Minecraft Seeds you need to play right now appeared first on VG247.